Vegatinos offered jackfruit tacos, the fruit cooked so that it tasted like al pastor, the spiced pork-on-a-spit tradition from central Mexico. Vegan by Victoria's, the host of the event, hawked dairy-free Mexican and Salvadoran pan dulce (sweet bread). Another stall blasted ranchera music as a stern-looking millennial wearing a Los Angeles Dodgers hat and a Pendleton jacket ladled vegan pozole (hominy stew usually prepared with pork) into big bowls while he sung its praises to a customer. Scheper stared in awe at it all. "[I'm] happy to not have white hipster vegans run all the vegan stuff," he finally said, tongue only somewhat in cheek. Vegan Latino cuisine has received some mainstream attention this decade, from New York City (where Erick Castro shares his Puerto Rican creations on Instagram at How to Be Vegan in the Hood) to Colombian-American cookbook author Carolyn Scott-Hamilton in Miami. But over the past year, pop-up festivals organized around Vegan-Mex vendors in Southern California have become a local sensation. They usually occur in working-class Latino suburbs like Santa Ana, Ontario, Highland Park, and Whittier. Full-time vegans – or white ones, for that matter — are a minority at these events. The majority of customers are young Mexican-Americans who heard about the pop-ups on social media, or through word-of-mouth best summed up the following way: No, seriously, it's good! And it tastes like the real thing! The movement's hype is such that vegan caterer La Venganza won L.A. Taco's annual Taco Madness competition for best taco in Southern California, beating far-more-established (and non-vegan) competitors. It's a victory that chef-owner Raul Medina quickly downplays. "I didn't win," he said. "Veganism did." The fast-talking, wise-cracking 34-year-old Medina is typical of a new generation of Vegan-Mex chefs: He simultaneously rejects and embraces the meatier side of Mexican food. Medina uses everything from jackfruit to the hardened skim of soy milk to tackle taco classics like carne asada, chicken, and even tripitas — beef tripe. Medina says a white vegan customer "once came up and asked, 'Why would you veganize tripitas?' " he said with a laugh. "Because it's culturally nostalgic working-class food. You can't just dismiss that." Medina started La Venganza three years ago in Oakland, while working as a paralegal for an immigration attorney. "I wanted to find a good vegan taco de carnitas," he said, "and I couldn't find an affordable one. They were only at affluent vegan hipster spots." He took inspiration from vegan traditions in the East Bay's communities of color, specifically Buddhist temples and Souley Vegan, a famous soul food spot. And he also thought about his father, who was dying of complications from diabetes. "Everyone has a dad like that," Medina said, a reference to the fact that U.S. Latinos and African-Americans are more likely to develop Type 2 diabetes than whites. There are many factors behind these health disparities, including limited access to stores that sell fresh, healthy foods in lower-income Latino and African-American communities. Health concerns are one reason why veganism is growing in popularity among African-Americans today. "Blacks .... already had a solution for food deserts," Medina said. "It's called veganism." Medina moved down to Southern California last year after his father died and decided to keep La Venganza catering going in memory of his papi. He offers tacos every Tuesday at Mission Bar in Santa Ana; on a recent evening, the line was nearly out the door. Working with pre-cooked ingredients and a hot plate to heat tortillas, Medina cranked out tacos almost as fast as he got orders. "Limes, bro, you forgot the limes!" he cracked at an Asian-American customer who had quickly run off with chorizo tacos made from granulated beets. "It's the worst, nastiest, saltiest, oiliest meat you can find," Medina said of the traditional pork sausage. "Why not make it vegan? Why are we just giving up that [vegan] market to rich people? We need to take back our ingredients and meals, and make it available to people of color." 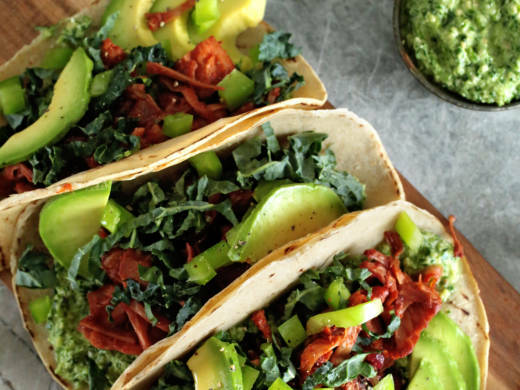 There are no hard numbers on how many Mexican-Americans are vegan, but this way of eating isn't so far off from what their ancestors ate in pre-Columbian times. Before the Conquest, most of Mexico's indigenous natives followed a plant-based diet. Beef, pork, chicken, lamb and goat — the mainstay meats of modern-day Mexican food — all came with the Spaniards. "Many of our dishes are vegan by nature," says Loreta Ruiz, who runs La Vegana Mexicana with her two college-age children, Loreta and Luis Sierra. "But just the word 'vegan' scares [Mexican] people. It's like, 'Our food is so rich and so beautiful, why are you going to alter it?'" 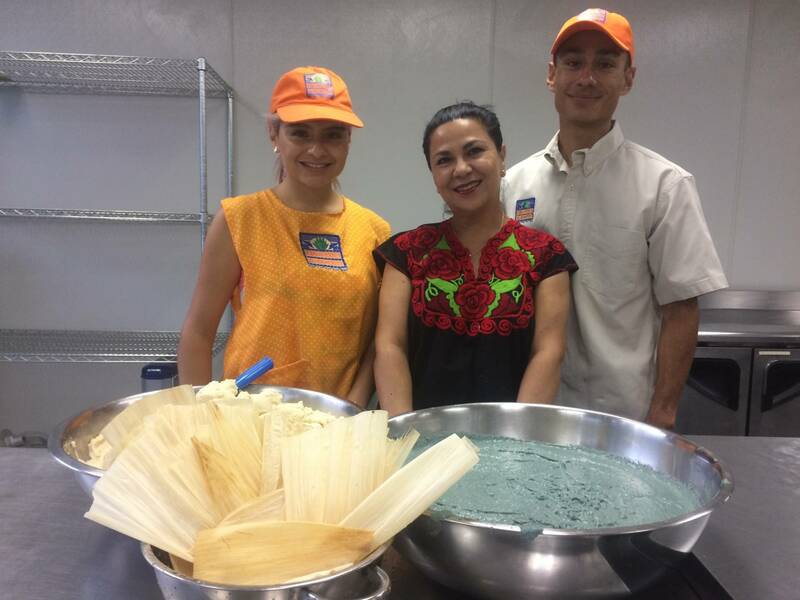 La Vegana specializes in tamales, using a lard-free masa (cornmeal) that Ruiz said took two years to perfect so that her tamales are properly fluffy and moist. She and her children do stage pop-up food tents at community festivals, but their focus is on trying to break into restaurants and supermarkets. Ruiz grew up in Mexico City with a father who was vegan "before it was a thing." But she didn't give veganism a try until her daughter, Loreta, was 8. "Even at that age," Ruiz said, "she was questioning about why we needed to drink milk, or why we needed to kill animals." The family tried to go vegan to support the young Loreta but found that a lot of the vegan food at the time was processed "and didn't even taste good." So Ruiz experimented in her kitchen until friends suggested she sell food to the public. Her job with the Mexican consulate kept her busy, but she finally decided to debut La Vegana last year at a Dia de los Muertos event. The family sold tamales so fast that they couldn't thaw them out quick enough. But customers didn't seem to care – drawn perhaps by the novelty at first, they stayed around for the flavor, Ruiz says. "I was amazed at how many people wanted to try our tamales," Ruiz said. "One guy came back seven times through the night, because he wanted to try them all!" Ruiz's daughter, Loreta Sierra, isn't surprised that Latinos of her generation seem more open to going vegan. (A young Salvadoran chef in Los Angeles veganized over 40 of her country's meals). "Our generation overall is more concerned about environmentalism and environmental racism — the future of our planet," says the 22-year-old, who is currently an undergraduate at the University of California, Los Angeles. "If we want to have a habitable planet, we need to start being more proactive in what we consume." Her brother, Luis Sierra, still encounters heavy skepticism from other Mexican-Americans about his Vegan-Mex lifestyle, but he takes it in stride. "Guys on my crew, they make fun of me all the time," says the 19-year-old, who volunteers for the Los Angeles Fire Department. "'Oh, yeah, that's why you're so skinny!' But then I give them one of my mom's tamales, and they change their mind right away."